Many families may not know that LEGO® offers many educational products for students in kindergarten through college. 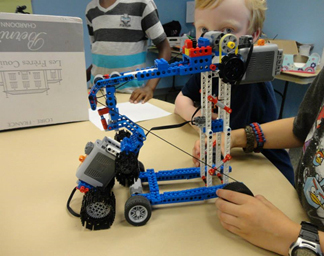 Wow Science incorporates LEGO® in our tech camp because it offers opportunities to bring many principles in the physical sciences to life. 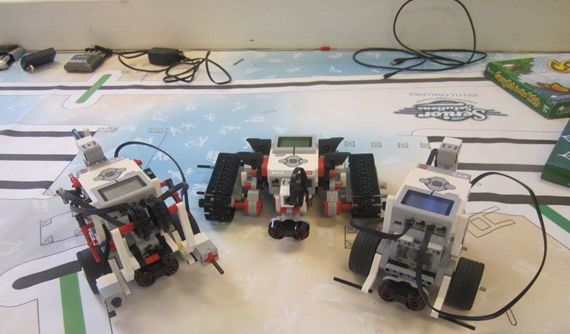 Our main and teen campers use LEGO® Mindstorms, for example, to conduct many robotics projects. This LEGO® activity sets harness knowledge of engineering and physical science to build and program robots. develop interpersonal skills as they work together to complete various projects. also a lot of fun! Main campers who wish to learn the basics in working with LEGOs may choose to participate in this session. Enhances Visual Motor Integration (coordination skill). The hands-on nature of LEGO activities facilities hand-eye coordination in children. Excellent visual motor integration is a necessity for success in many science fields. Stimulates analytical thinking. The step-by-step process involved in LEGO activities stimulates analytical and critical thinking skills in children. It fosters an environment where they have to pay attention to detail. Stimulates creativity and imagination. People become very good at the skills they develop and nurture. One of the reasons LEGO educational products are so popular is their versatility. Children can essentially create with LEGOs whatever they can imagine. If we can unleash their creative abilities, we open a bigger world of possibilities to them. Promotes visual spatial development. LEGO designs involve attentiveness to the relationship between line, color, shape, space, and form. This enables children to develop visual spatial skills. Children who possess strong visual spatial skills excel at completing jigsaw puzzles, geometry, manipulating objects mentally, playing chess, repairing machinery, and drawing diagrams and illustrations. These are all qualities that make for an excellent STEM professional. Develops social skills. Children constantly have to work together in many of the activities in our program. They learn to address each other, rely on one another for help, ask questions, follow instructions, and experience the impact of the behavior on others.